When I first saw the Space Marine Character conversion set from Forge World, I couldn't help but think how cool all the little bits looked. Especially the combi-flamer. Not that it's the most practical weapon in the game, it just looked so cool to me. 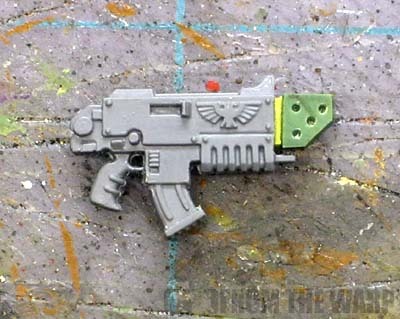 As I was working on something the other day (I don't remember what it was), it hit me like a train that I could build my own combi-flamer relatively easily with nothing more than a regular bolter and some greenstuff. It's easier than you think it is. All you need is some greenstuff, a sharp pointed X-Acto blade, a regular bolter (any bolter will do), a small piece of plasticard and superglue. The first thing is creating a hamburger like shape of greenstuff that is as thick or even better, slightly thinner than the thickness of your bolter. The thickness is important, you need it to be consistent so your flamer vent looks correct when glued in place. You want both sides nice and flat and smooth. Once that cures, you trace out the shape of your combi-flamer tip into the middle of the greenstuff. 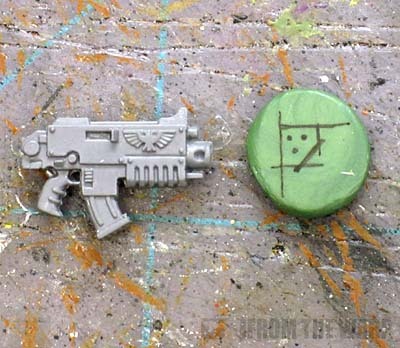 Do it next to your bolter so the scale is correct. Remember it has to fit on the end of the gun when you're done. Using a fine tipped marker, I drew out the shape I wanted. I kept it simple in this case since this was more to see if it would work than anything else. You could make it more involved once you get the hang of it. I also marked out a few spots where I planned on drilling out my vent holes. I drilled out my vent holes first so that I could hold onto the piece while drilling. I used the very tip of my X-Acto blade and kept them small so the scale looked correct. You can see the difference between my plan and the reality as I found myself trying to get more holes on the vent so it looked more like a traditional flamer vent and not just some kind of strange barrel. The plasticard is cut out in a tiny piece and used as a spacer between the new vent tip and the gun. This gives it a better look than just setting the new piece directly onto the face of the gun. And that's it, instant combi-flamer! as ever i find it extremely interesting that you use green stuff for things i would never, ever consider. just like your bolter barrel tip, i would always use plasticard rods (squared off ones in this case) for this sort of thing. But then, i am a terrible (seriously, tragically awful) sculptor, but somehow quite a good technical scratch builder. the thought of using green stuff even to fill gaps makes me recoil with horror. I'm in the same position as Atreides here. Looks great, Ron. I'd consider lightly sanding the edges ever so slightly. That way the front half won't look quite so blocky in comparison to the rest of the bolter. cool > practicality, most of the time, unless you're a really serious game-player. and that looks pretty cool. I'm in the same boat with Atreides and Krisken here, I couldn't model to save my life. This looks great, a simple conversion that takes little time. Krisken: Yes you could. You could actually reshape it a bit to better match the FW version too. This is really just a good "starting" point for this conversion. Dave: Combi-melta huh? That one might be a bit tougher to do. But there is still work to be done, that clip has got to go! Truth be told, I am not exactly sure whether I like the method, but the fact that you're doing a hard edge shape out of Green Stuff - something I find a pain, hence Magic Sculpt - deserves a healthy amount of respect, at least from a mediocre craftsman such as myself. When it comes to looks... guess I'm a bit too enamored with underslung weapons - but then again, I see no Picatinny rails on bolters. Anon: There's always more work to do! Marcin: The hard edge is easy to accomplish. The look though is a matter of personal taste. Underslung weapons have a certain coolness about them, no denying that. Anon: Sounds very cool looking. Nicely done Ron! I'm giving it a go as we speak. lycanthropica: Maybe this will give you a slightly differnt look.